Increase your Score with Multiple Choice Strategies! Increase your Score with Multiple Choice Strategy! 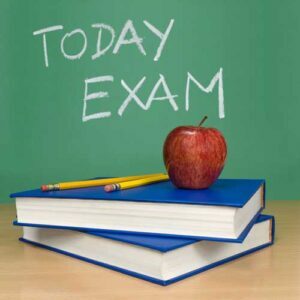 Like most standardized tests, in your academic career, you will be taking a LOT of multiple choice exams. And after certification you will be MAKING multiple choice exams for students. You start to take a test feeling the jolt from the coffee and candy bar you downed for “energy”. You see the first question and get puzzled. Where’s the “All of the above” option? Your palms start to sweat. Your mouth gets dry. Then what’s this? How did the person next to you already finish? You begin to panic … and all your effort goes to waste. Have you ever felt like this? Complete Test Preparation, Inc. is pleased to offer Multiple Choice Secrets: Multiple Choice Tips and Strategies to Increase Your Score to help you become more confident when taking a multiple choice test and to improve your grades by understanding how you need to study for these specific tests. Unlike an essay question that forces you to have detailed knowledge of a single topic, a multiple choice test forces you to have knowledge of many details. The format forces you to select one correct answer among other “distracters”. This requires a different way of studying and this guide will help make sure you are studying properly. Taking a multiple choice test is more like a marathon than a sprint. The number of questions alone can make them intimidating. It’s not about answering questions quickly; it’s about answering questions correctly. Every student has their own pace. Students that embrace this challenge use different test-taking strategies to help maximize their score. Many multiple choice tests are straightforward, but sometimes an instructor will throw in a trick question or two to separate the best from the rest. We’ll show you what to look for so you can be one of the best. Believe it or not, a common problem for people who struggle with multiple choice tests is failing to answer every question. This is especially troublesome when they know that a question you don’t answer is just as wrong as a question you answer incorrectly. 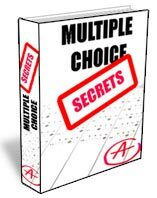 When you order Multiple Choice Secrets: Multiple Choice Tips and Strategies to Increase Your Score you’ll get many practice questions with detailed commentary and an answer key. This instant feedback lets you understand why your answer is right or wrong. And, because these are just practice questions, you’ll develop the habit of answering every question. We’re confident that these 15 secrets will give you an advantage over other students. But we understand that, for many students, just hearing the word “test” can cause anxiety, no matter what kind of test it is. So when you order Multiple Choice Secrets: Multiple Choice Tips and Strategies to Increase Your Score, you’ll get two bonus publications to help your test-taking skills. My niece did a great job on her SAT and it’s due in part to this. The information is presented in an easy-to-read way that appeals to teen readers and others for whom taking standardized tests is a relatively new experience. There’s an easy-to-follow breakdown of the various types of multiple choice questions found on standardized tests. And it covers techniques such as process of elimination, tactics for reading passages, how not to fall for trick questions, and step-by-step instructions on how to choose the best answer. It also offers plenty of sample questions that allow you to utilize the 12 strategies that’ll help you uncover the best answer in the least amount of time. It even breaks it down further by addressing the different types of Multiple choice questions and giving samples for each of them (English grammar, basic math, word problems, etc). Yes, I want to learn these 15 secrets and start scoring better on my tests! How do I get my copy? You receive immediate access via a pdf document. When you think of all the things you’ll spend $19 on this week, isn’t it worth that much … and more…to finally become the best student you can be. Simply click here to order. Helped me look at multiple choice questions in a different way so that I could begin to improve my scores. I recommend, especially if you want to get the best possible score. My niece did a great job on her SAT and it's due in part to this. The information is presented in an easy-to-read way that appeals to teen readers and others for whom taking standardized tests is a relatively new experience. There's an easy-to-follow breakdown of the various types of multiple choice questions found on standardized tests. And it covers techniques such as process of elimination, tactics for reading passages, how not to fall for trick questions, and step-by-step instructions on how to choose the best answer. It also offers plenty of sample questions that allow you to utilize the 12 strategies that'll help you uncover the best answer in the least amount of time. It even breaks it down further by addressing the different types of Multiple choice questions and giving samples for each of them (English grammar, basic math, word problems, etc).